Ratatouille features regularly on our menu throughout the summer. Besides being uber-healthy, incredibly easy, and perfect for a "dump cook" like me, it is also super tasty. And really, that's what matters most, right? Versatile - It's not just a side dish. 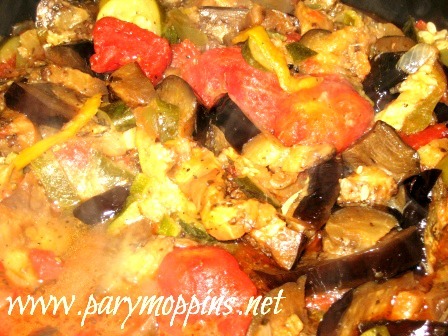 Ratatouille can be a main meal when stirred in with pasta, or mixed into a quiche or frittata, or spread atop French bread and covered with cheese to make a pizza. Quick & Easy - Rough chop the veggies and shove them into the pan as you go. Stir the pot every once and awhile. No fiddling required. Healthy - Antioxidents, organosulfuric compounds, vitamin C, monounsaturated fatty acid (MUFA) you name it, this dish has got you covered. Nothing Wasted - Use what veggies and herbs you have growing in your garden. This is particular good at the end of the harvest as well when you have those last few veggies with which to deal. If I have small tomatoes, I leave them whole or bigger tomatoes I roughly chop into chunks. Freezes Well - When the bounty of the garden is over taking my kitchen, I will make a huge batch of ratatouille and separate it out into freezer bags. Turn the stove on medium and start heating your pan. Go a couple of turns around the pan with the olive oil and put the onions and garlic into the pan. As you chop the veggies, throw them in the pan. Sprinkle over the dried or fresh herbs, chili flakes (if using them) and salt to taste. Give the mixture a good stir and put a lid on the pan. You may need to add a splash of water to the pan, it depends on how juicy your produce is. Stir every once and awhile. It takes about 30-40 minutes for everything to cook through. I'll have to save this one, since my husband was asking for it the other day, and I've never made it.